Our vision at Clanmore Montessori School is to offer a unique educational program for children of ages eighteen months to fifteen years. We offer a top quality environment which meets the total needs of the child and fosters family life. The program is based on the philosophy of Maria Montessori, who developed an approach to children consistent with their natural development and their fundamental desire to learn. It is our aim to offer individual attention to the development of the whole child. To reach this goal, fully trained teachers guide and mentor the children using the principles of freedom within limits and self-directed activity. This allows each child to achieve his or her potential, without pressure, and to develop a keen sense of self. At Clanmore, we respect the rights, dignity and integrity of each child. The program consists of carefully planned days with a focus on individualized programming. There are opportunities for individual and group activity, both indoors and out, yet always within a warm and caring environment. developmentally appropriate activities lead to the emergence of self-esteem, personal dignity and mutual respect. The children become confident learners, channelling curiosity into exploration and experimentation, all amidst a developing inner self-discipline. Concrete experiences and manipulative Montessori materials lead to a deep understanding of abstract concepts. Physical, emotional and intellectual independence is supported and at the same time there is the freedom to make mistakes and to learn from them. Many concepts are explored from a cross-disciplinary perspective, integrating learning into everyday life. As a result, adaptable thinkers emerge. As the children at Clanmore are consistently together with others of different ages, an atmosphere of family life prevails, providing the children and their families with a feeling of belonging. We look forward to warmly welcoming you to the Clanmore community of children, families and school. The mission of Clanmore Montessori School is to provide the finest quality authentic Montessori prepared environment for children ages 18 months to 15 years. Clanmore responds to and inspires each individual child in the school academically, intellectually, socially and emotionally and optimally prepares them for life. • Adhering as closely as possible to the Montessori pedagogy and practice as developed by Dr. Maria Montessori and to the standards set out by the Canadian Council for Montessori Administrators CCMA). Housed in a beautifully restored historic building, with a modern, aesthetically captivating new addition, Clanmore is situated in southeast Oakville (bordering Joshua’s Creek Conservation Area). 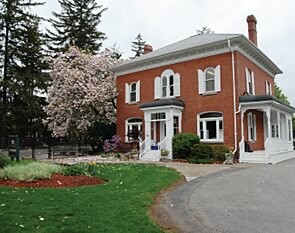 Clanmore is an Oakville private school providing a top-quality academic program in a rich, stimulating environment. With low student-to-teacher ratios and a highly qualified, caring staff, our atmosphere is warm and inclusive. We nurture the child’s self-esteem and self-confidence, thereby unlocking individual potential and encouraging academic and social growth.